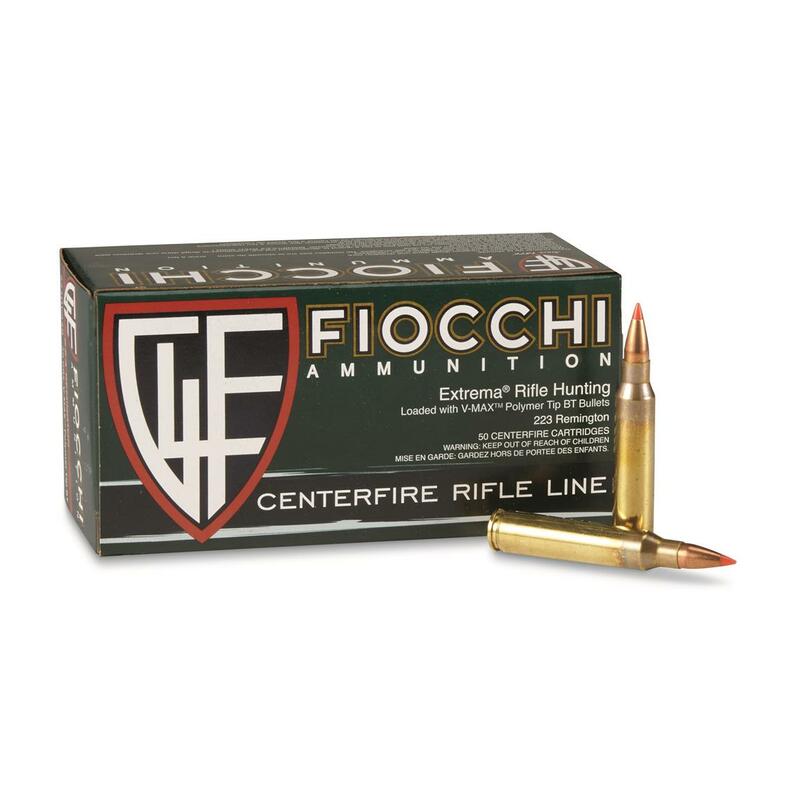 Fiocchi® Ammo is made with only the best American powders loaded on state-of-the-art equipment in the U.S.A. You'll get match-grade components with ultimate performance for the hunt. 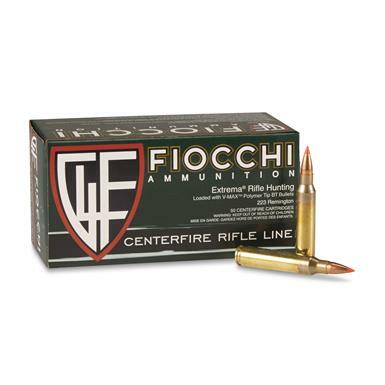 Fiocchi Extrema .223 Remington, V-MAX, 50 Grain, 50 Rounds is rated 4.9 out of 5 by 50. Rated 5 out of 5 by JSVV from Good price for some really nice ammo. Rated 5 out of 5 by Don Z from Incredible accuracy at great price I used these for Prairie Dogs for the the first time last weekend. These are the best rounds for an ethical and instant kill. When I switched from the previous 50 gr. ammo I had to dial it down about an inch at 100yds and it seemed to get more accurate the more I shot . Shooting them in a Savage bolt action varmint rifle and got excellent performance. Two friends on the hunt with me are switching over to these. Rated 5 out of 5 by Smokeum from Great price with deadly results! Use these rounds for prairie dogs. Every shot is an explosion. I have also used the rounds for ground hogs in Virginia and they work perfect. Worth every penny! Rated 5 out of 5 by Steve M from Great Price Great Ammo at this price. Rated 5 out of 5 by Gabe from Shooting at 125 yards using these 50 grain V-MAX 223's I have a Rock River Coyote with a 20 inch Ba These are excellent hunting rounds. I shot a target today at 125 yards. I took a picture of my target. a couple of holes were from a Remington model 700 30-06 that I bought new in 1963 and killed a truck load of deer with it. This Coyote is the most accurate rifle I shot in a long time but this ammo is great and real fun to shoot. Yesterday I shot a coyote at close to 275 yards and he was hit and run into the woods. Rated 5 out of 5 by Gabe from The most accurate ammo at 100 yards. Shot out of my 5.56 Rock River Coyote I tried a box of 50. My son went out and tried some .223 at 100 yards. He said they were the most accurate ammo he has tried. We have Rock River AR's . I have a 5.56 Coyote with a 20 inch barrel and a 6.8 Rem with a 16 inch barrel. We have our own range where we shoot up to 400 yards. We got into some hogs rooting up the pasture and my son killed 5 with my 6.8 Rem. Rated 5 out of 5 by wytail144 from Coyote Medicine Been Using these rounds for a few years they are affordable and I really like the terminal results.....the coyotes aren't huge fans though. Primo USA-made "critter getter" rounds.